Kimberly A. Beis has a diverse litigation practice with a focus on intellectual property and other complex commercial disputes. Her practice includes matters of patent infringement, antitrust, unfair competition and complex breach of contract, as well as investigations by the Securities and Exchange Commission (SEC) and the Financial Industry Regulatory Authority (FINRA). She has experience with all aspects of civil litigation, including pre-suit investigations, discovery, motion practice and trial preparation in both state and federal court. 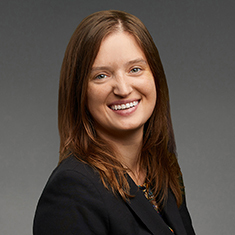 Prior to joining Katten, Kim worked as litigation associate representing individuals in a wide range of personal injury matters from case evaluation through settlement and jury trial. Kim also received extensive training in legal research and taught legal research workshops to attorneys and paralegals while working as an account manager with Westlaw, a Thomson Reuters company. While attending law school, Kim served as an editor for the Northern Illinois University Law Review. Kim is also an active participant in Katten's pro bono legal programs through the firm’s partnership with the Jose de Diego Community Academy, a Chicago public school. Shown below is a selection of Kimberly’s engagements.